Manipulation of TV coverage is a crucial factor in Putin's extraordinarily high popularity ratings, typically in excess of eighty per cent--ratings that Donald Trump both admires and envies. Everything Trump equals to everything America. We have enough threads about it. Yes, as if that means anything. At least President Trump, unlike the ex-HNIC, is leading America from the front, & couldn't care less if Europe, or the World for that matter, likes it or not. Let Europe pick a new leader of the "Free World".... Trump believes that the title is over rated, if there's nothing in it for America. When it eventually hits the fan (& it will), & everyone looks for a leader -- which they will, President Trump will decide what he thinks is the best deal for America.......what's in America's interests......should he be the bystander & watch how they handle the heat, or get in & reap the spoils. The Free Lunch is no longer there for the World's ravenous appetite. It's going to be more like pay as you go form here on out. It's about America First, .......not Global Likability, that's important. Way to go Mr. President.....Way to go! Odd that Obama got what he did. He did more computerised bombing than GW Bush did and neither did he improve the lot of the tens of millions living at the bottom of the ex-colonies, eh? Shame the ex-colonials get saddled with the system they got but there again it was the early corporates who started that stuff. "Those who fly solo has [sic?] the strongest wings." Time to send America to a planet on their own. Thanks to Trump and his electors, America got back to North Korea level. Well the country has never really been a proper democracy. It was created by their own late 18th century corporates and the majority of people did not have a vote. Look what it has produced and the world effected by the negativity. Does show that it wasn't only Dr Goebells who was clever at propagandising people. Actually, the free lunch is what America has experienced for the last 50 years. We're an opioid nation that hardly manufactures anything. Yet, we have pretty high standard of living as far as consumer goods and housing is concerned. Why is that? Because America has a low income, at almost slave labor level, world supporting its consumer needs. This didn't happen by magic. Its due to trade deals and the projection of American power and diplomacy that has put us in such a favorable position. We're the ones who created the trade rules that favors us, the world banking system that gives us preferment. Now Trump is throwing away what generations of Americans have worked hard to get us. As Singaporean Prime Minister Lee Hsien Loong warned bluntly on a visit to Washington in August, TPP put America's "reputation on the line" with its partners in the region. Another Trump hypocrisy is his Buy American mantra. This he recently announced his Made in America Week week. Not that he walks the talk. But, then like Trump, talk is cheap. The products Trump companies sell are almost all imported. The steel in Trump buildings came from China. Just about only the MAGA hats worn by his morons is supposedly made in the USA. We're the ones who created the trade rules that favors us, the world banking system that gives us preferment. Actually we use the British system of banking. Trump said various things in his campaign then seems to do a dance on some of the stuff now. We all know that there are of course many quite sensible people over there but there are an h of a lot who are not and the fact they run into millions is shocking and only emphasises the unfortunate internal state of the country as well as what it does outside. The system is a farce I am afraid and there are tens of millions who are in difficult circumstances while the corporates increasingly zoom ahead. makes things so damn farcical. Apart from the terrible hypocrisy and the many, many who are being treated like peasants it is a damnable shame the decent are stuck with the system. Trump is an obvious example and there is of course a lot of niggling going on mover there but the system can produce people like Trump which only epitomises the deep flaws. Have known individual people from there who were beyond reproach and a decent contradiction of what passes for that word 'system.' Tens of millions flocking to that man will make no difference to the vast poor army and the way the nation is run. The way trump is flip-flopping he could be a mental penguin. We were at a time that we though that in the western democratic world never a psychopath could be ever elected again. Americans demonstrated that we were wrong. They claim for their own production of Hitlers, Stalins, Neros and the such. Unfortunately for the Americans who are sensible the place is run by two corporate lots. Because of that many over there were a bit frustrated and although Trump is a businessman they thought they would go for someone who was not brained by the Hill mentality. It does say one thing that is distinct that only the Yanks could end up with someone like that! For long long time (centuries) no one is behaving as Trump does. At least, he was supposed to do things with style. I have to say this about Trump that he although playing word games with the North Korean idiot has been just playing word games with the dictator. However the Korean head-banger is a disgrace and danger. He thinks he can get away with flying rockets over other countries - such as Japan threaten to shoot down US planes even if not over North Korea is mind blowing. It is bad that NK is doing what it does and just ignoring even increased sanctions and crossing swords with the UN but murdering and starving it's own people is despicable. Kim Jong-un is worse than Trump and does not care a damn about law, international law, respect of other countries and so on. Are places like Japan and South Korea just to put up with this>L War is not something I want to push for but if the evil git steps over the line from what he doing something needs to happen to him and eventually get the people free. Meanwhile, in Berlin: The rise and fall of the Berlin Wall and why it matters today. The Berlin Wall stood for 10,316 days. As of Feb. 5, 201, it has now been breached for over 10,316 days. From now on, Berlin will live with the memory of the wall for longer than it lived with the wall itself. For the generations that grew up in a divided Berlin, the fact that the young will not experience such a life must be seen as evidence of the city's achievement. Still, there is something lost as the hard-won lessons and perspectives of living in the shadow of the wall begin to recede. Berlin wall does not have much similarity with the Mexican border. Berlin wall has more similarity to the Jerusalem wall. 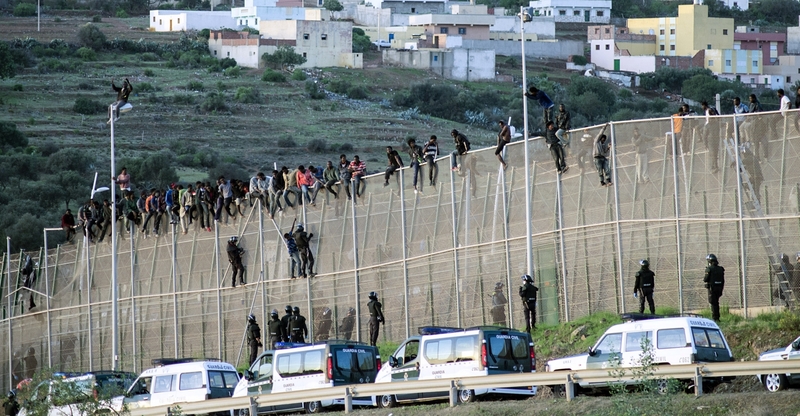 Or, let's face it, the border in Melilla. Mexican border is different because it runs mostly in rural areas where nobody lives. And there isn't such a disparity of wealth between the USA and Mexico as it's cracked up to be. Of course, it's useful for Trump to keep cracking things up. Now President trump is shoving up military expenditure and what a nonsense that is. Secondly having been impressed watching the big French military parade with their President he would love the same thing to be done in America? I would say this. I groan as the French were a lot smarter than the American idea of military display and so other places including my own country would put on a proper military show just like France. When it comes to such stuff in the ex-colonies they are amateurs. Even the way I once watched a US army squad marking time with their legs being raised backwards it is the kind of style wee girl would do here. All they are doing is walking in step no crispness at all Even the way they carry Colours is head shaking! . Don't do it man in the White house because others do it better.